Have you always wanted to take a trip revolving around art and culture? The Ligurian Riviera inspired the great Impressionist painters like Monet and Gaughin. Let Nyala Wonder Travel show you the most beautiful art exhibitions. At the heart of the journey will be the Palazzo Ducale in Genoa: a unique location with unique exhibitions! From here we will head off to visit the places portrayed in the works of Claude Monet, such as the town of Dolceacqua situated on the Western Ligurian Riviera, and then take a tour of the Matisse Museum and the Chagall Museum, both situated in Nice on the Cote d’Azur. Arrival in Genoa during the afternoon, check in to the hotel and free evening to visit the wonders of the Ligurian capital city. Overnight stay. The morning will be spent at the famous Palazzo Ducale. You are free for lunch. In the late afternoon, transfer to San Remo, check in to your hotel and dinner. After dinner we suggest you take a look at the Municipal Casino… to indulge your passion for gambling! After breakfast, trip to Dolceacqua, a beautiful medieval village situated at the entrance of the Nervia Valley, not far from the French border, and the setting for many paintings by Monet. The village is divided into two parts, connected by a bridge that dates from the Middle Ages. The oldest part, made up of tall and closely-packed houses built along winding uphill alleys, is situated at the foot of the monumental castle of the Doria family. 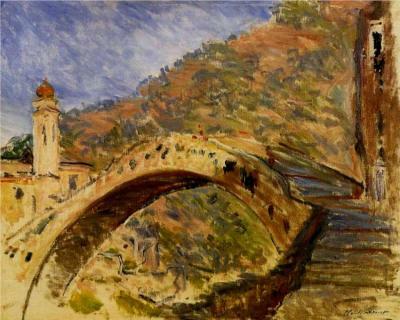 The spectacular scenery consisting of the ruins of the castle that once belonged to the famous general Andrea Doria, and by the medieval bridge, was portrayed by Monet during his stay in the Riviera. The flatter and more open section of the village features artisan workshops, typical restaurants and evocative cellars where it is possible to sample the Rossese, a typical and exclusive local wine. At lunchtime a sampling of wine and local products await you in a local cantina. In the afternoon the trip will continue towards Bordighera, where you can visit two of the most characteristic villas-museums of the Belle Epoque. Villa della Regina Margherita, a dwelling commissioned by the Queen of Italy, was re-opened in 2011 after an accurate restoration that returned it to the glories of the past. Today it houses a marvelous museum full of works from the Italian and European eighteenth and nineteenth centuries: precious paintings and furnishings. You will then cross the historic center of Bordighera to reach Villa Pompeo Mariani, the final visit of your day devoted to the arts. You will be guided through a magical visit following in the steps of Monet, who in this very park painted 3 works, and you’ll have the chance to visit the charming studio of the painter Pompeo Mariani, a contemporary and friend of the master. At the end of the visit, return to the hotel, dinner and overnight stay. A morning trip takes you to Nice where you can visit the famous Matisse Museum, contained in a Genoese style building near Cimiez, which celebrates the long stay of the Northern French artist with an exceptional collection of 68 paintings and hundreds of drawings, books and photographs. Nearby, the Chagall Museum, opened in 1966, was intended by the artist of Russian origin to host his most evocative work: the seventeen large canvases depicting biblical sayings. Lunch to be arranged independently. Heading towards Cagnes sur Mer you can visit the abode of the great Impressionist master: Pierre-Auguste Renoir. The artist settled in 1908 on the French Riviera, where he built this Provence-style house and cultivated his vocation inspired by the light and colors of the Mediterranean. At the end of the visit, departure towards your home location. Round trip travel, transfers to the locations described, and anything not included in “Our offer includes”. Lunch and dinner should be selected according to the menu of the day or the sampling menu suggested by the chef. A’ la carte drinks and orders are to be paid for on the premises. The suggested visits in the program are to be considered free, hence without a guide.